BBC pundit Garth Crooks says Brighton's win over West Brom on Saturday is merely papering over the cracks and the Seagulls will not stay up this season unless they make signings in January. 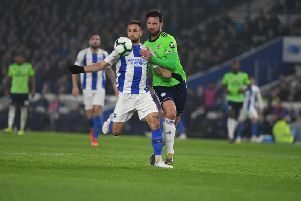 Brighton recorded their first Premier League victory of the season with a 3-1 success against West Brom and two-goal hero Pascal Gross was named in Crooks' team of the week on the BBC website. However, when writing about Gross' contribution to the win, Crooks said: "I heard Brighton boss Chris Hughton say on Football Focus this weekend how he was realistic enough to accept that he is in a different league to quite a number of teams in the Premier League. "Well, the reality is he is in the same league whether he likes it or not and he had better tell his owners the truth - Brighton will not survive the season unless they buy in the January transfer window, having failed to make an impact in August. "Make no mistake, Brighton's victory over West Brom was a fantastic effort, particularly under the circumstances. But don't be fooled, this Brighton side is not good enough to survive in its current state. Gross' brilliant two-goal performance against the Baggies is merely papering over the cracks. "Even Tony Pulis, who is normally very protective of his players in public, had to come clean and criticise their attitude after the game. Brighton cannot survive on the occasional charitable offer from teams who can't be bothered and that's what West Brom's performance amounted to. "Other teams, even in the league Hughton and his owners think they are in, won't be offering such lame performances as West Brom in the future." Crooks' team of the week in full was Courtois; Stones, Tarkowski, Lascelles, de Bruyne, Eriksen, Gross, Mendy, Kane, Choupo-Moting, Welbeck. The Seagulls will be looking to make it back-to-back wins when they travel to Bournemouth on Friday. Defender Lewis Dunk says the Seagulls have to quickly build on the win against West Brom.